One trick to living well on less is to think one step ahead. Easter baskets get harder to find & more expensive in April. I washed this dusty trio ($2) with warm water and a squirt of detergent. 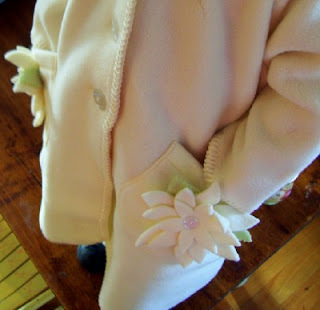 At the same store, my mom and I bought a fleece coat to layer over Elise's spring dresses ($4). As usual, these deals are amazing! Those are really nice baskets! I agree with you. I always try to plan ahead. It is essential for saving money I bought chocolate Kisses for 75% off after Christmas to use for Valentine's cards. I pick up little things all year long on clearance for birthday party goody bags - nail polish, pencils, etc. so I'm not giving out a bunch of junk at birthdays. And sometimes birthday presents for classmates are bought in bulk if I see a good deal. I once bought 8 pairs of pajamas from the Disney Outlet online for $40. It lasted for 6 birthday presents for friends and one for each of my daughters! Great idea to start thinking about Easter! I love that coat! Had not thought about watching for Easter stuff now. Will be watching for a few things I need. Thanks for the reminder. I keep forgetting I need two of everything now! Cute coat. I love fleece for kids coats--breathable for the warm ones (my youngest), soft and yielding for the sensitive touch ones (my oldest) and water resistant for those times it starts to sprinkle. beautiful finds! and i couldn't agree more....planning ahead ranks in the top 10 most important frugal tricks! I purchased Belgium chocolates on clearance after Christmas for my husbands Valentine chocolates . I found a nice pair of heart shaped chandelier earrings on clearance for my son's girlfriend before Christmas and put them up for Valentines day . I am in the process of finding the best deal on flowers. I always try to shop and plan ahead. Fantastic set of baskets, and I am absolutely in love with the coat! I love the baskets :) and the coat is gorgeous! Great finds! I love the baskets. We use the same baskets each year. I've wanted to get nicer ones, but the kids are attached to their flimsy cheap ones now. Thinking ahead is good! I'm working on getting meals planned for "sick days." Those days I'm either under the weather, or days I'm holding a feverish child. I'm working on coupons/sales for frozen stuff. Those are days money flies out the widow with hubby picking up take out! OOOOO, I love the baskets. I miss having little ones to fill baskets for. 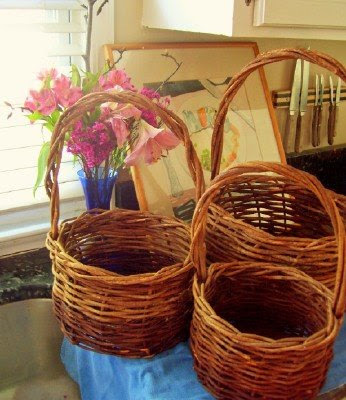 I cobbed together 2 baskets last Easter, but have since given them away as gift baskets. I knew I'd need a 3rd basket for John, and this set seemed perfect. You cant tell from the photo, but they nest inside one another for storage. I plan to keep this set for a good long time. Thanks for stopping by my blog and I'm so happy to have found yours and can't wait to meet you at Blissdom! Great tips - I'll be back! Oh, I love that little jacket- it is precious. The little details on it are so sweet. Spring!! Can't wait for it to get here. Looking out my window I see about 2 1/2 feet of snow that is not melting yet! Great Baskets and really cute coat. Love 'em! I was also looking at baskets a few weeks ago but they are SO expensive at Goodwill ($5-$9). Even on half-off day, that's insane. I'm glad I didn't spend that $$ because I finally happened on a little thrift store here that has always been closed when I've gone. Now I have a good idea where you find some of your great deals! I also live near Nashville but I stick close to home so I've never visited any of the good stores you've mentioned in the past :) Anyways, great find! What a cute coat! I always had trouble here in the Northeast with Easter clothing in general. Most of the time it's COLD! That fleece coat is perfect for any weather event, while being very stylish! Awesome coat! I love those flowers on the pockets. I'm sure there's a way to email you but I don't know what it is! Anyway, just wanted to get the word out that Denny's is giving each of it's customers a free Grand Slam breakfast Feb. 3 from 6am - 2pm at all locations! Free breakfast for me and the kids, yay! I love that little jacket! So sweet! Great deals, as always! I am thinking spring too - I treated myself to a huge bunch of tulips for $5 yesterday, anticipating the grey, soggy day we are having here in PA.